Snowboarder Ben Rogers and his friend Phil Draper signed up for our 2015 Monster Ski challenge because they believe that ‘life’s a game to be played, life’s a challenge to be met and life’s an opportunity to be captured’. 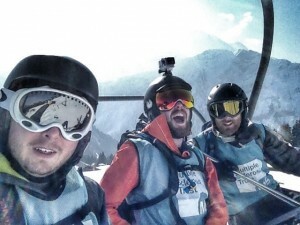 Here Ben shares his experience of snowboarding 90,000 vertical feet in Chamonix to raise funds to support people living with MS. Months of excitement and anticipation had brought us to this moment. It was Friday morning at Heathrow airport and we were all meeting for the first time ready for the Monster Ski Challenge. Before we knew it we were checked in and heading towards our destination, Geneva airport. We arrived in Geneva greeted by glorious sunshine and ready for our expedition. Drew, the driver of our airport transfer van, took us through picture perfect scenery in the French valley and then the imposing snow topped mountains appeared. We reached Chamonix at 2pm and had plenty of down time to unwind and get to know the area. The views were amazing, however the -20 wind chill was a stark shock from the mild temperatures in the valley! In the evening we were briefed on the challenge ahead. We all met at 6pm for welcome drinks at the hotel bar, introduced ourselves to each other, then listened to the briefing from the ESF instructors. Afterwards, we enjoyed an evening meal and had an early night ready for the challenge the next day. Day one of the challenge had arrived and a big breakfast was in order to fuel us up ready for the day ahead! At 8:40am we met at the bus stop and made our way to Les Houches. The instructors took us straight up the Télécabine du Prarion, where we got our ski legs and were split into two groups. Tom Humpage, a professional photographer, also joined us for the morning. However, he had such a great time he stayed with us for the whole day! 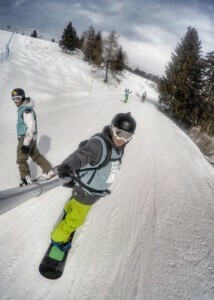 He took some great photos of the group, he’s a really talented photographer and snowboarder! We made ten full descents of the mountain to reach our 30,000ft target for the day, mainly skiing the black Kandahar piste – a fast tree lined run through the forest at the base of Mont Blanc. The day started with firm pistes until the afternoon when conditions had become slushy making the descent much more of a challenge! We stopped for lunch after eight descents at a picturesque restaurant with stunning views of the mountains, including the glorious imposing Mont Blanc. We met with the other Monster Skiers for a quick pit stop, refuelling for the final two descents of the day, and completed the day’s challenge at around 4pm. Day two started again at 8:40am at the bus stop and we decided to return to Les Houches. It was another nice day, but a bit cooler and cloudier giving us much better ski conditions than the previous morning. We made the most of the conditions and rode hard in the morning to try and beat the afternoon slush! After lunch we made our way to the other side of the mountain, St Gervais before heading back to Les Houches for the final descent of the day which was very slushy, but was also great fun jumping over the mounds of snow that had accumulated. The final day of the challenge arrived. We met at the bus stop and decided to head to the notorious Les Grands Montets to make our final 30,000ft decent. It was very windy and overcast in Chamonix and we were quite apprehensive as to what the conditions would be like up the mountain. The ski bus was extremely crowded and it seemed like quite a long journey heading up the windy roads! We arrived and took the Plan Joran and Bochard gondolas up to just under 3,000 metres where it was lightly snowing and pretty windy too. Visibility reduced throughout the day and the snowfall become heavier until we reached the mid station where it brightened up a little. We made six descents to reach the 30,000ft target, five before lunch and one in the afternoon. After having our final lunch together on the mountain we made our final run to complete our three day challenge. We regrouped at the bottom of the Grands Montets and thanked the instructors, Beatrice and Manu for their excellent guidance. In the evening we met at Bar’d Up for a presentation by Russell Hardy, Monster Skier and former Chair of Trustees at the MS Trust, where we were all given an award. The ‘Burning the wick at both ends’ award was handed to Matt as he was able to stay out all night and ski hard all day. Robbie won the ‘King of speed’ award for reaching a top speed of over 68mph. ‘Mr Calm’ award went to Max for his calm approach despite not having skied for a number of years. ‘Father figure of the trip’ went to David, who could always be relied on for his level headed decisions. ‘Funny guy award’ was given to Neil – he had a great sense of humour and kept everyone smiling. ‘King of the mountain’ went to Mark who was never phased and skied hard all day long! The ‘Beer monster’ award went to Joff, who also carried round a handy hip flask always full of marmalade vodka. ‘Mother of the slope’ went to Emma who was always looking out for everyone and making sure everyone was OK. The ‘Queen of organisation’ award went to Vicky from Ski Independence – without her planning the trip would not have gone as smoothly as it did. The ‘Loudest snorer’ award went to Les – as a result of his snoring we ended up with a lodger in our room (Sorry Les!). The ‘Cool guy’ award went to Phil – no matter how hard the going got he was always smiling at the bottom of the slope. The ‘Inspirational person of the trip’ went to Ben H, for shredding hard and completing the challenge, showing great determination to not let MS hold him back (legend!). 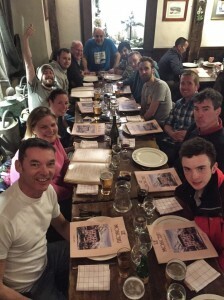 We then went to La Boccalette for our final evening meal together and congratulated each other before a few final well eared beers in the bar to complete our trip! For me the whole experience of fundraising, learning about MS and meeting people who suffer in various ways has been a truly humbling experience and will stay with me for the rest of my life. Thank you to everyone who helped organise this amazing event and congratulations to everyone who participated for your fantastic achievements. Here is a link to a short video of our trip and to those of you who are thinking of taking on the Monster Ski challenge in the future, DO IT!